A home’s exterior paint is not just a way for it to look pretty; it actually has an important purpose. Like your skin, the paint serves as a barrier against outside elements that would either deteriorate the outside finishes much quicker or, worse, could infiltrate the inner structure of your house. When coming and going from our homes, we often stop noticing small changes on its exterior. A piece of trim that was once only slightly loose may now be drooping several inches, exposing the soffit above and providing an entry point for insects or water. A repainting project creates the perfect opportunity to notice issues like this and correct them. Since fresh paint will not hold to a dirty or disheveled surface, the first step is to prepare the surface by fixing any problems, covering up holes with putty or caulk and then sanding away irregularities on the surface. During this time, you are bound to notice problems you had ignored for years, such as a mildew-y spot near your porch steps or a patch of paint that was peeling badly. Once surface preparation is complete, your issues will be dealt with and replaced by a clean, fresh coat of primer and then paint. Living near a body of water like Niagara Lake, you often encounter nature a few more times than you would like. Homes that are neglected can see mildew, insect invasions and water damage along with elemental problems like heavy rains, winds or falling branches. Over time, these elements take their toll upon your home unless you enact measures against them. Paint is one of the most important of these measures. A high-quality exterior paint will shield against external problems like moisture or insects, giving your home a barrier that can prolong the lifespan of its exterior finishes. Like maintenance problems, you may not have noticed how your exterior paint color has faded over the years. Drab homes do not look flattering in photos, and visiting them in person is hardly any different. Fresh paint, even if it is almost the exact same color, will reflect light in new ways that catch the eye and add to character as well as curb presence. 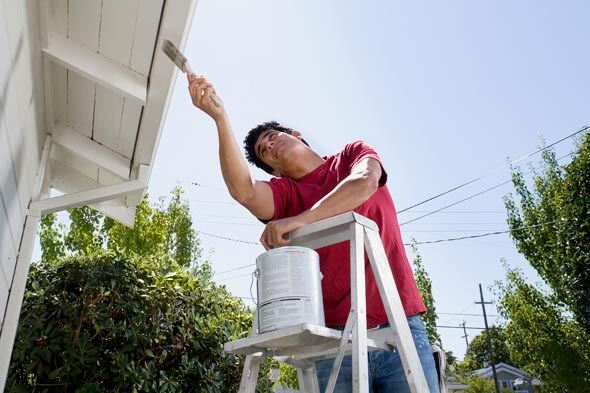 For all these reasons, you should consider having your home repainted before a sale. Unless you have performed the project recently, you will likely be able to reap significant benefits while adding to the home’s appeal and value. To discover more advice about preparing your home for a sale, visit the Niagara Homes sellers page. This entry was posted in Blog, Uncategorized and tagged Exterior, repainting on July 24, 2015 by wp_admin.